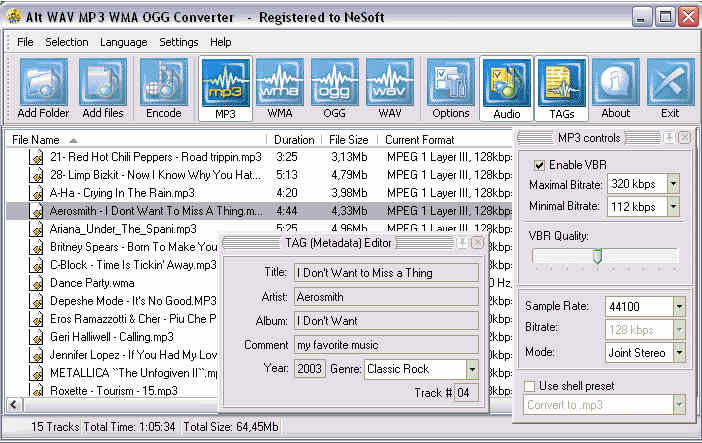 With Alt WAV MP3 WMA OGG Converter you can make your music library by the easiest and fastest way. Convert WAV, WMA and OGG to MP3 ,WAV, MP3 and OGG to WMA ,WAV, MP3 and WMA to OGG. is designed to convert MP3 WMA WAV OGG audio files from one format to another. is a mp3 encoding and decoding program. It can help you encode WAV files to MP3 files and decode MP3 files to WAV files. is the ideal tool for converting between MP3, WAV, WMA and OGG files. Convert WAV, MP3, MP2, OGG to WMA,WAV, MP3, WMA, OGG to MP2,WAV, MP3, MP2, WMA to OGG ,MP3, WMA, MP2, OGG to WAV.